Stretch marks or striae are indent, lean and parallel red lines observed mainly in stomach, abdomen, thighs, upper arms, buttock and breasts. Over the time its color fed naturally and it becomes of white color. Most common causes of stretch marks appearance are pregnancy and obesity. Women are the most likely victim of stretch marks than men and it is quite normal as most likely women get stretch marks during or after their pregnancy. This is only because abnormal stretches in their body occurs and this change in body structure cause to create stretch marks especially in stomach and breasts. These are fixed lines which never get completely disappear over the time. Only with intense treatment, it can get a little bit fed. Sudden gain in weight is another most common reason for stretch marks. These lines look different from the nearby skin and color. It causes sometimes itchiness and sore but this is very rare. Rapid changes in hormones are one of the factors causing stretch marks appear in our body. This change in hormone occurs due to many reasons such as while pregnancy, puberty, obesity etc. In all these phases of life occurrence of stretch marks is very normal and it cannot be avoided or obstructed. Yes later on some treatment you can provide which can make its appearance fed. Cortisone is the hormone which causes stretch marks on your body. This hormone generates from adrenal glands naturally. Under the condition its production rate is very high then it creates stretch marks on different parts of the body. Excessive cortisone hormone also causes the skin to lose its elasticity. More than the 60% women observes stretch marks during their pregnancy as at this point of time unusual changes in body structure, especially in the stomach, is occur and this overstretch causes skin to get stretched especially in the stomach area and breasts. These are the two most likely body parts which get stretch marks during the end months of before delivery (7 or 8 months of the pregnancy time) or sometimes post pregnancy (after giving birth to the baby). Some stretch marks removal cream can be applied before these marks appear in your body as a precaution to get rid of these marks but there is no guarantee whether these creams will work or not. Sudden or rapid gain or loss in body weight causes stretch marks appearance especially in thighs, upper arms, buttocks, and stomach. When your body starts gaining weight your skin faces sudden stretch and this abnormal growth in weight makes the skin stretcher suddenly which last forever in the form of stretch marks. These marks are initially of red color and look unsmooth and different from nearby skin area. Over the time these red color turned to light and looks brighter. Just like rapid gain in weight, if you start losing your weight rapidly then this also creates the stretch in the skin because of abnormal and sudden weight loss causing stretch marks. Sports people like athletes and bodybuilders who have to put on or lose weight suddenly for certain sports requirement etc. are most probably observes stretch marks appearance especially in thighs and upper arms. Stretch marks appear on the different body parts in the puberty period of human life. Puberty is a phase of life when girls and boys get sexually mature. This causes the rapid change in body structure and hormonal changes too in both girls and boys. 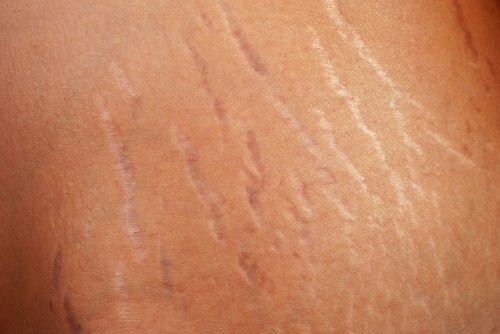 Stretch marks appear due to this sudden change in body structure. In girls, 10 to 14 is the age of sexual maturity whereas in boys they come to their puberty phase in between the age of 12 to 16. This is the period when girls and boys are more than a kid and less than an adult. Sudden and rapid stretch in the skin causes to appear these marks, especially in shoulder, thighs, and back. Adolescence or teenage is the time frame when you are on your way to maturity in life both physically and mentally. This is the time when you can take your decisions more prudently and you start looking more than a kid. Lots of hormonal changes also appear in this phase of life. All these reasons together put stretch marks on your body. Teenage period lies in between 13 to 19 of the age. At this point of time growth hormones are found in an increased quantity. Due to rapid contrast in body growth, stretches your skin and slowly it takes the form of stretch marks. These naturally grown marks are for the whole life though it might get fed over the time. Adrenal gland disorder which includes medical health problems such as Cushing syndrome, Marfan syndrome and Ehler-Danlos syndrome causes abnormal growth of cortisol which is the primary reason for stretch marks visibility in the body. Stretch marks are considered as Cushing syndrome symptoms. In this disease, your body starts putting on overweight especially in abdomen area and this causes stretch marks in arms, breasts , thighs and abdomen. Acne is the other symptom of this disease. AS skin gets thin and fragile so it easily develops to stretch marks. Again people having Marfan syndrome are more susceptible to develop stretch marks. In this context, we can say that stretches in this condition don’t occur due to changes in weight. This health condition appears due to genetic issues leading to skin thin and fragile and causes a decrease in body tissues elasticity and strength. Stretch marks mainly appear in shoulder, buttock, breast, back, abdomen and thighs. Out of disorder, inheritable connective tissue Ehler-Danlos syndrome observes. Stretch marks are the primary symptom of this health issue. The corticosteroid products like pills, lotions, and creams cause stretch marks on different body parts of the skin. This mainly happens because skin loses its elasticity or capability to stretch causing stretch marks appearance. Stretch marks can be easily diagnosed just by the physical examination of your body. Once it is diagnosed Doctor’s ask for your past medical history as it can be an outcome of some past medical related concern. Also, they ask for your current medication list if you are taking any for some medical problem. In very fewer cases if Doctor finds that your stretch marks are been observed because of some underlying health problem then they ask for scan report, blood and urine test to get to know about the accurate cause of these marks. These marks generally don’t cause any problem like pain or irritation but if any underlying issue is observed after diagnosis then immediate medical treatment should be provided. 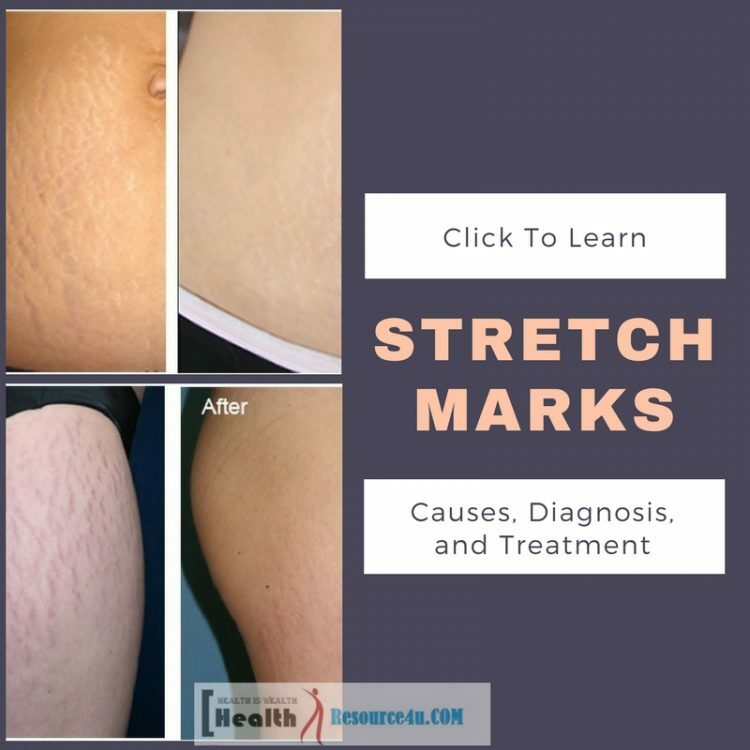 Over the time stretch marks get fed and less appears but if some medical concern is observed because of which the stretch marks are appearing in the body then it needs medical treatment. Also, people who want immediate relief from these marks can undergo medical treatment to get rid out of it. Below some common treatment procedures are been described for making its appearance very less visible. Stretch marks are indented parallel red lines which mainly appear in the stomach, thighs, upper arms, and breasts which really looks very dull. You can get rid of your stretch marks by going through medical laser therapy. There are two types of laser therapy for removing these marks. First one is for removing newly developed stretch marks which are called pulsed dye laser. This procedure helps in reducing the redness of these marks. Another laser therapy is for removing very old formed stretch mark which is called resurfacing laser. Under this therapy stretch marks or lines are smoothened. 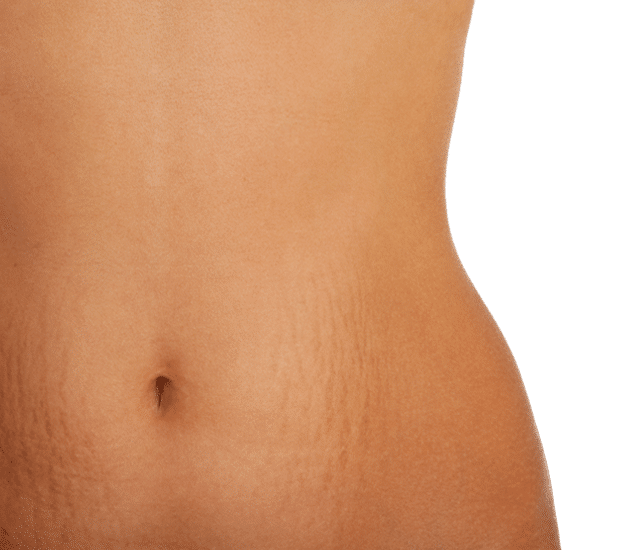 Under microdermabrasion process, some fine crystals are applied over the skin as an exfoliant for removing the outermost layer of stretch marks. After the removal of the epidermis where these stretch marks exist, collagen production is persuaded and then a new and fresh layer reveals. This process helps in removing even older formed stretch marks too. The tummy tucks is a very costly process of removing the stretch marks fully from your abdomen. In this process, surgical treatment is applied which cuts the abdomen portion where these marks are appearing. This surgical process of removing stretch marks is also known as abdominoplasty. Under chemical peels procedure of stretch marks removing rich alpha-hydroxy acid solution is applied over the stretch marks for damaging these skins. This damaging process is done internally so that the afterward healing treatment can be applied once the skin gets completely damaged. A fresh and new layer of skin generates in the place of stretch marks out of this chemical peel process. The micro needling process is a newly developed procedure of removing stretch marks which stimulates the collagen production capability of your body and without making any damage. By inserting few fine needles the epidermis is induced to generate more collagen. You can apply the tretinoin cream over the area where stretch marks appear as this cream helps in the production of more collagen which increases the skin’s elasticity. These creams contain Vitamin A which is a vital factor for the generation of body collagen. As the amount of collagen increases, the skin which is affected by stretch marks gets improved. 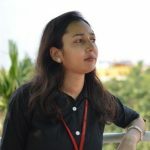 Apart from medical treatments, there are some trusted and result oriented natural or home-based remedies are there which can help in fading the stretch marks appearance. Some important, as well as fruitful natural remedies, are mentioned below. The regular application of olive oil over the stretch marks area in the body helps in diminishing its appearance within few months. This is a rich essential oil which moisturizes your skin and makes it hydrated by going into the pores. Apart from that, the vitamin A, D and E ingredient of this oil helps to repair the stretch marks by improving your skin’s elasticity. You can apply the mixture of alfalfa leaves over the stretch marks area as its leaf is rich with essential amino acid which is very important for soothing or repairing the affected skin area. This plant contains Vitamin E and K which fights against the free radicals and improves the health of your skin by smoothing it. Prepare a mixture of potatoes and apply it over the skin area where stretch marks are appearing. Leave this application for 30 minutes and then rinse it. This healthy natural remedy will decrease the appearance of the affected area within few months. This is quite easy to prepare and not even expensive. So anyone can afford it to prepare it in their home only, for getting rid of stretch marks. Potatoes are rich in vitamin and minerals contents which are essential for the refurbishment of the dermal cell; also it tends to increase the growth of these cells. You can drink also the potato juice or can rub the potatoes over the stretch marks area on daily basis. You can buy a lotion containing cocoa butter ingredient as this is a vital element for improving the appearance of stretch marks. Apply the cocoa containing lotion every day for getting smoother, moisturized and supple skin (where stretch marks lie). Fine granules ingredient of sugar works as a natural exfoliant. You can add sugar to your daily essential oil or honey and apply this paste gently over your skin. This will help in removing the dead skin cells and hence fresh and new skin appears over the dead removed skin cells. Apply this natural homemade paste on your stretch marks daily for getting rid of deep and dull looking stretch marks. Regular care and immediate treatment on stretch marks can diminish its appearance but you should always remember that you cannot get completely rid of these natural marks. So once you are aware of the causes of stretch marks appearance keep yourself prepare with its prevention steps so that you will be less affected by these marks.